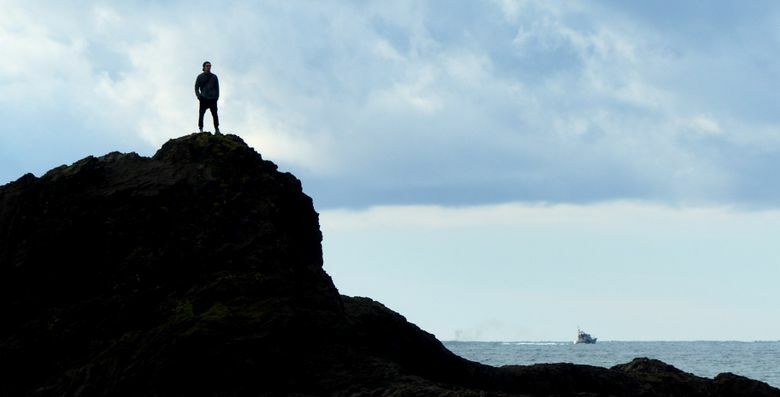 Visit the land of the Quileutes and wander some of the Pacific Northwest’s most rugged coastline. LA PUSH, Clallam County — Gazing out across First Beach to 160-foot-high A-Ka-Lat, a small island that has forever been sacred to the Quileute people, I was transfixed by the idea of what life would have been like on this windswept coast — barely more than a rock’s skip from America’s northwest corner — in the days before electric lights and heat you could summon with a switch. Even today, tsunami evacuation-route signs are a constant reminder of human vulnerability here. Looking out at A-Ka-Lat’s fir-topped rocky cliffs from the giant picture window of a luxury cabin my wife and I rented at the tribe’s Quileute Oceanside Resort, I couldn’t help but wonder, with all due respect: How on Earth did they hoist burial canoes up in those trees? It’s a unique allure of this remote beach retreat that you’re immersed in the culture of the indigenous people who’ve lived here for centuries. In this one-restaurant oceanfront village — with no casino, no golf course, no bumper cars or Skee-Ball — there are few distractions beyond what you see out the window. But what you see is worth the trip. That viewis a stunning panorama of this Northern Olympic Peninsula coastline, riddled with small islets the shape of giant cupcakes topped by Douglas-fir “candles,” along with sea stacks, natural arches and rocky needles rising from the crashing, ill-named Pacific. A-Ka-Lat, translated as “top of the rock,” is also known as James Island, said to have honored either a tribal chief known as Jimmie Howeshatta, or Francis W. James, the first white man to climb the rock, who is said to have helped translate the Quileute language to English. The island was a sea stack connected to land before the U.S. Army Corps of Engineers rerouted the mouth of the Quillayute River and cut off the land connection. Centuries ago, it held a tribal village and even, at one time, a community garden. With its difficult access, it also served as a fortress against raiding tribes from the north. In that earlier era, the bodies of tribal chiefs were sent to the heavens in their canoes, boosted into the island’s treetops. How the pallbearers did it, without modern block and tackle or a utility-truck “cherry picker,” one can barely fathom. Before you visit, see the tribe’s website and print a sampling of tribal history and some of “Raven Tales: Traditional Quileute Stories of Bayak, the Trickster,” to read in front of your cabin’s fireplace (quileutenation.org/stories-and-tales). Raven stories have long been a tradition of tribes along the coast from Washington to Alaska. According to “Raven Tales,” the Quileutes were the southernmost tribe whose oral-tradition mythology included raven stories. “Bayak” is a crafty raven whose interactions with other animals such as Bear, Fishduck, Mole and Eagle usually incorporate some sort of lesson to be imparted by elders to attentive children. During a February visit, the beach was mostly crowded with crows. Maybe aspiring to be ravens. 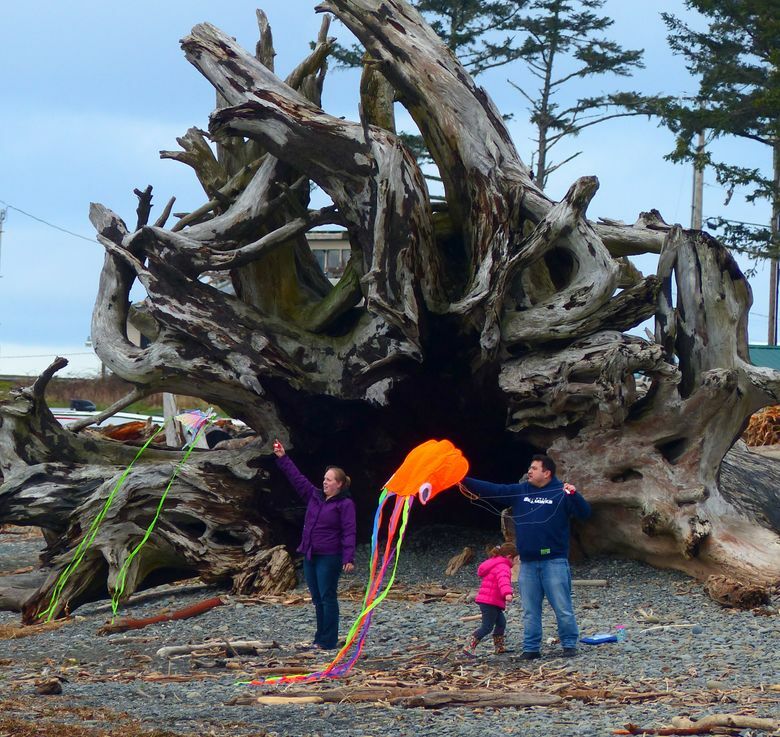 But beaches here mostly held smooth cobbles and agates, along with logs of fallen old-growth trees, some with two-story-high root balls resembling Medusa’s hair, tossed high onto the beach by storm waves. As we wandered, my wife pointed out a piece of polished wood resembling a rose petal. Another was like a perfect orca fin. I found a cantaloupe-color, fist-size chiton that a gull had snacked on. Offshore, the far buoy marking the harbor moaned a wind-triggered warning that sounded like a giant blowing into a very large beer bottle. Down the beach, a family with a toddler flew a kite with tentaclelike streamers and big eyes like a squid. This was the essence of a weekend in La Push. Before dusk, we took a window table at the recently renovated River’s Edge Restaurant, looking out at the mouth of the Quillayute, a smattering of fishing boats and more sea stacks. Brought by a friendly server with elaborate, artful tattoos, dinner was fish and chips, a bargain at $9.99 for three big pieces of panko-crusted cod, as fresh as the salty wind outside. If La Push isn’t far enough out on the edge of the continent, you needn’t go much farther to find a truly wild beach. Drive five minutes back up Highway 110 toward Forks to the trailhead for Second Beach, in Olympic National Park. 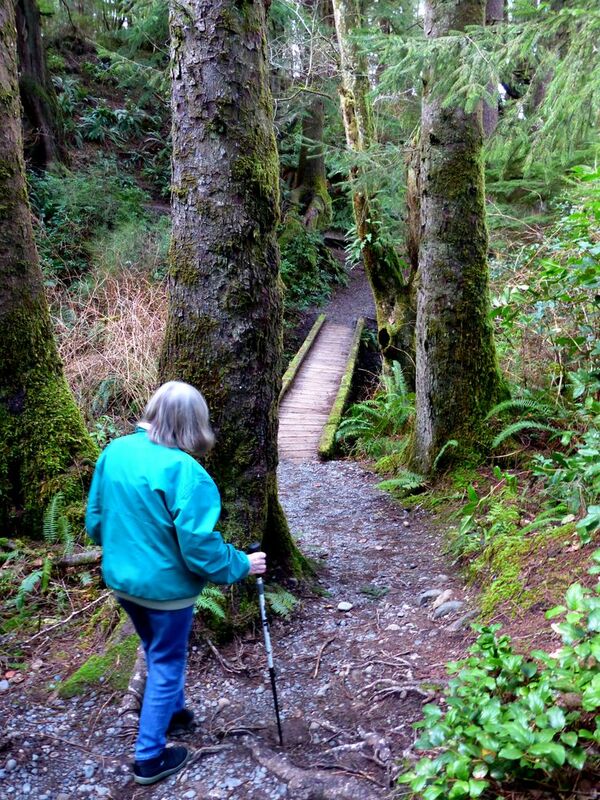 We walked .7-mile through a rain forest of sword fern, lush salal and big second-growth hemlocks and firs, many with “tunnels” through the roots where nurse stumps had long since rotted away to leave trees that looked ready to stretch their legs like Tolkien’s ents. Dropping steeply for the last 100 yards, the trail emerged at a giant barricade of interwoven drift logs that challenged our gumption. But once that obstacle was clambered over, the reward was a true wilderness beach. A cape at the beach’s north end, marked by a natural sea arch, blocks all view of La Push and man-made structures. This is the northern edge of Quillayute Needles National Wildlife Refuge, named for the pointed rocks rising like knitting needles beyond the surf and set aside by Teddy Roosevelt in 1907 as one of the earliest national refuges in an effort to protect habitat for sea birds. It felt like we’d just landed on a planet with a whole new set of geological forces at work. The long and broad beach had room for many visitors to roam, with some motivated to climb to the tops of sea stacks. “It was so worth it,” another couple agreed as we huffed and puffed our way back up the trail. The forecast for our final day predicted rain or even snow at the coast. Instead we awakened to a blue and breathless sky, perfect for a breakfast bonfire on the beach. With our $5 tribal fire permit and a $5 bundle of firewood from the resort office, we found long sticks on the beach, polished baby-bottom smooth by the surf and perfect for toasting bagels over our fire. That, a Thermos of good coffee and a drift log to sit on gave us the perfect perch from which to watch four hopeful surfers, clad in wet suits, boards in tow, as they walked down the beach into a cloud of sea mist that wafted Brigadoon-like over the water’s edge. One bagel fell off its stick. The five-second rule that says it’s OK to eat a dropped morsel if you pick it up fast enough had a failing here, I concluded, as a bit of sand grated on tooth enamel. But the smoky toastiness with a spread of butter was too good to toss away. “Yes, that’s my ATM back there — it’s my smokehouse!” Woodruff laughed as she opened a chest full of vacuum-packed fish for sale: $20 for a generous hunk, your pick. “We have only steelhead now, but come back later in the season for kings!” she confided, waggling an eyebrow in gustatorial anticipation. Who would need a better reason to return? 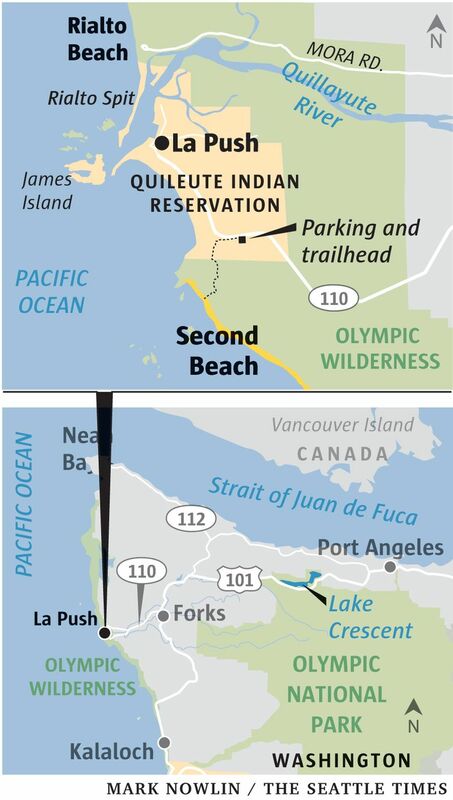 From the Seattle area, take a ferry across Puget Sound to reach U.S. Highway 101 and drive west through Sequim and Port Angeles toward Forks. About 55 miles beyond Port Angeles (about 1 mile before reaching Forks) turn right on La Push Road (Highway 110). Continue 14 miles to La Push. From Kingston or Bainbridge Island, allow about 3 hours in normal traffic. Note: Major rebuilding of Highway 101 around Lake Crescent, west of Port Angeles, may cause significant delays on weekdays into 2019. Check for updates: st.news/hwy101. 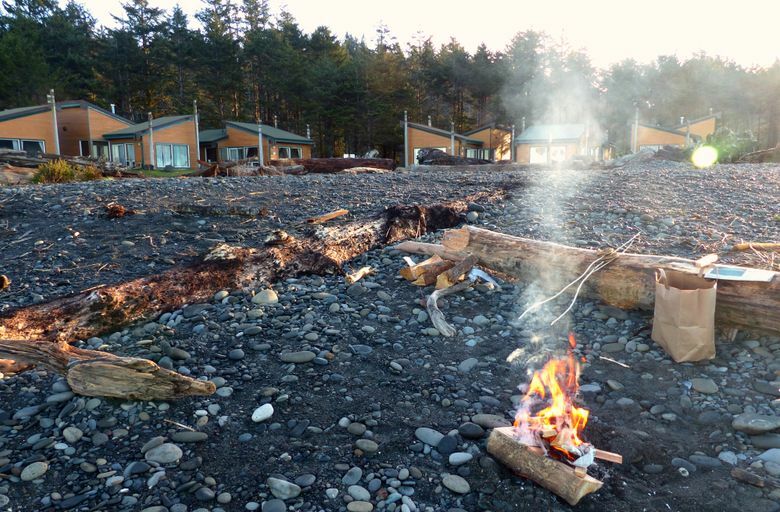 Quileute Oceanside Resort at La Push offers beachside cabins (simple to deluxe), motel rooms and campsites. Peak-season rates (late May through September) range from about $20 (campsite) to about $300 (luxury two-bedroom cabin), with two-night minimum stay; quileuteoceanside.com. 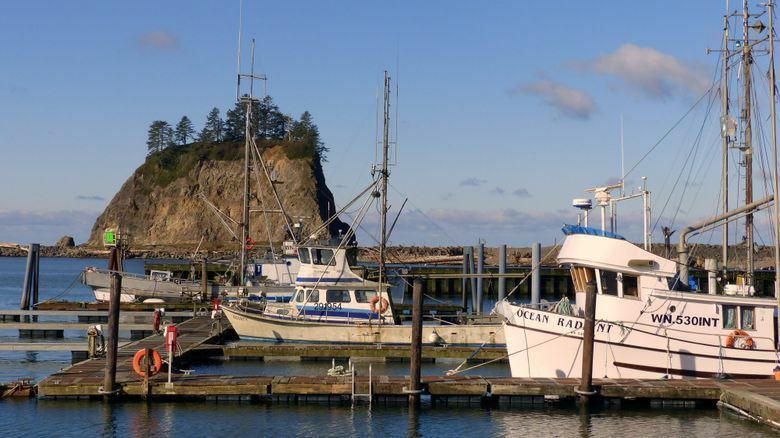 Fans of the Stephenie Meyer vampire-and-werewolf stories will enjoy a pilgrimage to their setting in La Push and nearby Forks, which hosts its Forever Twilight in Forks celebration Sept. 13-16, 2018: forkswa.com/forevertwilightinforks. • Familiar with Nash’s Organic Produce from its stand at Ballard Farmers Market, we made the 5-mile detour through Sequim to its farm store at Dungeness, where most products are local and/or organic and GMO-free, including fresh-from-the-field produce (such as beets, chard and rutabaga in cooler months). 10 a.m.-7 p.m. Monday-Saturday, 4681 Sequim-Dungeness Way; nashsorganicproduce.com. • Pressed for time? Another prime option for local/organic foods (without leaving the highway) is locally owned, funky and friendly Sunny Farms Country Store; 8 a.m.-8 p.m. daily, 261461 U.S. 101, Sequim; sunnyfarms.com. • Port Angeles Farmers Market operates 10 a.m.-2 p.m. Saturdays year-round, at Gateway Pavilion, U.S. Highway 101 (Front Street) and North Lincoln Street; farmersmarketportangeles.com. • For lunch in Sequim, we loved the Thai Pie (pizza with roasted squash, red bell pepper, scallions, peanut sauce and coconut curry drizzle, $12) at John Pabst’s Pacific Pantry deli cafe, where bread is baked with Nash’s grains and house-made sausages for take-away are on display. Pabst formerly worked at Capitol Hill’s Poppy. 229 S. Sequim Ave.; yelp.com/biz/pacific-pantry-sequim-2.